rate and a putting green! for a full presentation with photos, rates, directions, etc. AFFORDABLE oceanfront condos - white sandy beach! Relax in our affordable condos directly on the Atlantic with private sandy swimming beach! One and two bedroom units with kitchens, maid service, freshwater pool; restaurants, golf, parks and marina nearby. Discover our tropical island Inn connected to Marathon! You'll love our oceanfront family resort. Guest rooms, 1 & 2 BR apartments. FREE use of paddleboats, canoes and our very own putting green! Enjoy our pool which overlooks Florida Bay, and enjoy the sunsets over water in the evenings. A secluded setting. Rates from $69 - $138 depending on the season and the type of accommodation. 5 restaurants. 5 swimming pools - a true resort ! 60 acre island resort featuring hotel rooms, suites and 2 bedroom waterfront villas. 85-slip full service marina, 5 swimming pools, 5 restaurants, live interactive dolphin programs, kids clubs, tennis, and a variety of water activities. Very extensive website with streaming video and detailed activities info. Internet specials! 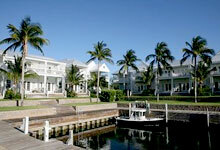 Directly on the water - GUARANTEED lowest rates! Brand new in the heart of the Keys, surrounded by family-fun attractions. 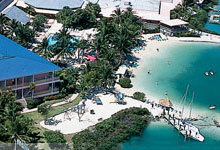 Enjoy nearby Dolphin Center, premier beaches, parks, dive sites, boat rentals. Or stick by the pool after a fitness center workout and free hot breakfast. Pet-friendly and 100% smoke free. 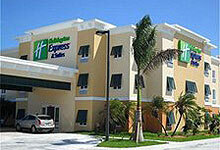 You are booking directly with this Holiday Inn Express - GUARANTEED by Holiday Inn to be the LOWEST RATE. Escape the Everyday at this Florida Keys jewel! Located less than one mile from the Marathon Airport, Indigo Reef is a splendid combination of luxury resort accommodations and amenities. Come and enjoy private docks on the Gulf of Mexico! 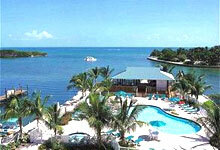 Indigo Reef Resort Villas is your ideal Florida vacation getaway in the heart of the Florida Keys. The Hammocks at Marathon welcomes you with beautiful, kitchen-equipped suites and all of the amenities of the Florida Keys. Rent boats and jet skis at the marina, charter a fishing boat for a thrilling day at sea, or just relax by the pool and tiki bar overlooking the Gulf of Mexico. Traveling elsewhere in Florida as well? East Coast Directory covering the East Coast of Florida. Entire site, © 1999 - 2019 Logical Sites, Inc.